A tractor that stands out from the crowd with sophisticated, attractive looks and unrivalled comfort. Conceived to be unbeatable between the rows, with robust steel tracks ensuring superlative stability, agility and flotation even on very steep gradients and rough terrain, the Lamborghini Strike CF also delivers impressive performance in open field and heavy draft applications. A tough of class that makes all the difference. The sinuous, cocooning forms of a design in true Lamborghini style, with a compact, sloped cowl ensuring excellent visibility and minimising crop damage, lend the Strike CF Trend a sense of unique and instantly recognisable elegance. Completing this already impressive package are a new driver zone layout, a tank shaped specifically to prevent fuel starvation and a choice of compact and efficient 3 cylinder FARMotion engines. In essence, tractors delivering uncompromised productivity and efficiency with an extra touch of class. The new Stage III B compliant 3 cylinder FARMotion is a concentrated package of advanced technology. An engine combining extraordinary fuel efficiency with minimal space usage. The FARMotion engine boasts class-beating solutions such as: a viscostatic fan, common rail injection with injection pressures up to 2,000 bar and advanced 7 hole injectors, electronically controlled exhaust recirculation with a cooled external circuit, and turbocharged forced induction with wastegate. 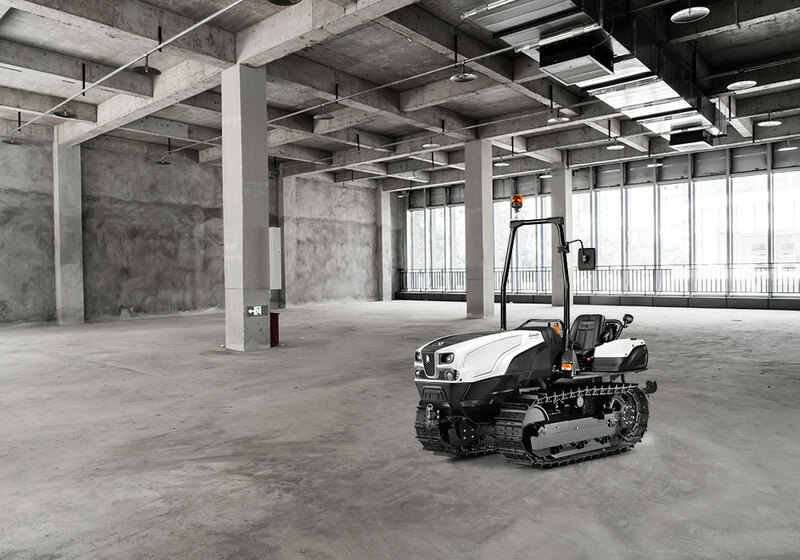 Features such as a single ancillary belt with automatic tensioner, the new PowerCore air filter and dual pull-out radiator guard grilles make regular maintenance simpler and quicker for maximises productivity. Efficient, simple to use and totally configurable: the bywords of the Strike CF. For uncompromised simplicity, efficiency and reliability, a choice of fully synchronised mechanical transmissions is offered. The Strike CF is available with 12 or 16 forward and reverse speeds. The 12 speed variant features a creeper gear to facilitate tasks at very low ground speeds, while the intelligently spaced ratios of the 16 speed variant, which comes with overdrive as standard, let the driver choose the ideal gear for any situation. A synchronised reverse shuttle makes for simple, seamless direction inversion manoeuvres. The steering clutches and wet disc brakes ensure extraordinary manoeuvring precision and offer a sense of total safety even in the most challenging conditions. A separate 25 l/min pump dedicated exclusively to the steering clutches ensures impeccably smooth steering action at all times, even with the engine at idle speed and when the distributors - fed by a different 50 l/min pump - are in use. Six rear distributors are offered as standard (or up to ten as an option), plus an additional two belly couplers (duplicated by two at the rear). The rear lift has a capacity of 2,800 kg. The PTO comes as standard with a proportionally engaged electrohydraulic clutch and an interchangeable output flange shaft, and offers both the universal 540 rpm speed mode and a 540 ECO mode. The flat platform is suspended on 4 silentblock mounts which effectively isolate the driver from vibration transmitted from the chassis and powertrain, while the effective mechanical seat suspension system ensures superlative comfort. On either sides of the revised driver zone are two new fuel tanks shaped specifically to prevent fuel starvation even when working on very steep gradients. Lamborghini offers a set of undercowl upgrades as an option to permit installation of an aftermarket cab, consisting of an increased capacity alternator, a compressor for air conditioning, lines for heating and an expanded electrical system. Conceived to reduce soil compaction and soil damage, but also to reduce vibration and noise, the new ComfortTrack tracks allow the tractor to be driven on public roads without the time wastage and inconvenience of fitting track pads.